When we’re considering a new product for our catalog, we look at several factors. Obviously, the quality of the product plays a major role. The availability and price also come into play. But, one of the biggest factors is whether it serves a unique and useful application. When new find a product that can make life easier for our clients, we don’t hesitate to add it. Today, we’ll be briefing you on five such products that you can now find at Able Distributors. If you have clients who are still using R-22-based cooling systems, it can be a real headache to recharge and maintain their equipment. That’s where Comstar’s RS-44b refrigerant comes into play. RS-44b is an HFCF-free R-22 replacement. As such, it is in accordance with EPA regulations and is legal for use after R-22 is banned in 2020. The best thing about RS-44b is that it is a drop-in replacement. This means that you don’t have to worry about changing the system, or even the oil, before using it. It has an equal flow rate, a similar discharge pressure, and it utilizes the same service equipment as R-22. Bosch’s Inverter-Driven Split heat pumps are the perfect product for Chicagoland. They provide high-efficiency cooling for the summer months and their heating capabilities are perfect for all but the most bitter winter months. Unfortunately, Chicago winters are known for their snow and condensing units don’t do great with half a foot of snow surrounding them. That’s where Diversitech comes in! They have designed a condenser pad specifically for use with heat pumps in snowy climates. Their Heat Pump Pad is the perfect complement to Bosch’s IDS heat pump. Normally, to lift a heat pump, you would have to install a condenser pad and add risers to it. Diversitech’s HP3232-8 heat pump pad combines these two components into one easy-to use product. The HP3232-8 is a 32″ x 32″ condenser pad with eight 8″ integral risers. Each riser features an anti-vibration pad to reduce operational noise. 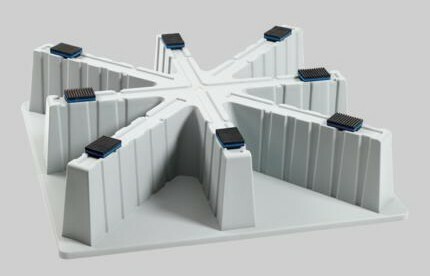 The base of the pad is designed with a slope which diverts condensate from cooling operations or defrost operations away from the equipment. The HP3232-8 is made from durable, environmentally-friendly recycled polypropylene. It is designed to withstand the elements, including UV light, and to last longer than the lifespan of the average heat pump. We’ve covered Nu-Calgon’s EasySeal Direct Inject sealant in the past, but this particular product adds a new twist. EasySeal-UV provides the same simple, effective seal as standard EasySeal, but it also includes UV dye. When combined with a UV light, this dye allows you to easily locate problem spots and larger leaks in the refrigerant lines. 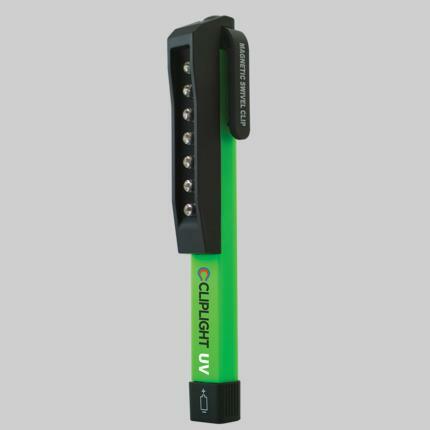 If you’re looking for the perfect tool to pair with Nu-Calgon’s EasySeal-UV Direct Inject, look no further than Diversitech’s DC89 UV pocket light. This flashlight features seven high-intensity UV LEDs; it’s powerful enough that you don’t have to worry about needing UV-enhancing glasses. The 89DC UV pocket light also has a magnetic swivel clip for easy mounting on the job site. While we pride ourselves on working with manufacturers who with excellent warranties, the fact is that even the best warranty won’t cover everything. Power surges, in particular, can wreak havoc on HVAC equipment. But your clients won’t have to worry about that with the Intermatic AG3000 surge protection device. It can cover 120V or 240V equipment with a voltage protection rating of 600-900V and is capable of withstanding up to 20,000 amps in a single surge. As a multi-type surge protection device, the AG3000 can be installed on either the line or load side. In fact, installation is so easy that it can be completed in less than 10 minutes. Once it’s hooked up, you don’t have to worry much about it at all; the AG3000 is designed with durability in mind. It can even be installed outside thanks to a type 4X NEMA enclosure that is UV-resistant and watertight. 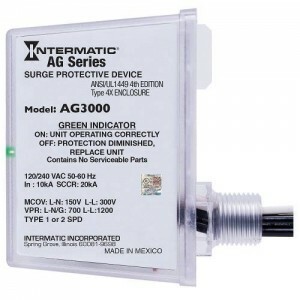 All of the above is great, but the best thing about the Intermatic AG3000 surge protector is the 3-year, $7,500 warranty that it extends to any connected equipment. With this surge protection device, your clients will enjoy complete coverage against almost anything. We’re always on the lookout for exciting new products that will make life easier, and a little for profitable, for our contractors. Be sure to keep an eye on the blog for more new product announcements, and never hesitate to let a salesperson know if there’s a product you’d like to see at Able!